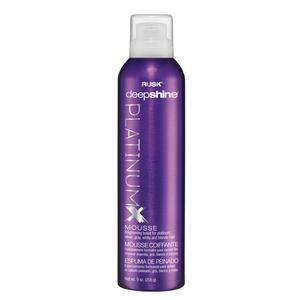 Give your hair a brightening boost with PlatinumX Mousse. This lightweight, alcohol-free styling foam for platinum, blonde, gray and silver hair enhances body and volume while restoring brilliance to hair color. Vitamin E supports hydration and promotes luminous shine. What is it? Rusk Deepshine PlatinumX Mousse is a lightweight, alcohol-free styling foam.